Bottom line: Zippy Shell’s free loading services and thirty days of included storage add convenience to your self-pack container move—if you’re near one of its warehouses. If you want a portable moving and storage company that offers thirty days of free storage on all long-distance moves plus free loading services in specific regions, look no further than Zippy Shell. Zippy Shell is only available in twenty-eight states, but the company partners with 1-800-PACK-RAT to offer you more locations and container sizes to choose from. Read on to see which areas earn Zippy Shell an A+ and where we think there’s room for improvement. What services does Zippy Shell offer? We’ll be honest: It’s hard to pin down accurate information about Zippy Shell. We struggled to get consistent answers about which services are available at which locations and which container sizes have been discontinued. What we do know is that when you move with Zippy Shell, the company will pick up your container from a nearby warehouse, drop it off at your home, and give you three days to load up your boxes, furniture, and that lightly used elliptical. After you load your container, Zippy Shell will take it to its warehouse at your final destination, where it will sit until you’re ready to have it delivered to your new pad. It has easily portable containers. It offers free loading services. It includes storage on long-distance moves. Zippy Shell has a unique design compared to other companies in the moving container industry. It uses a steel-frame cage (a.k.a. a shell) to store your belongings. This shell is then fitted inside a larger moving trailer, which protects your stored belongings from the elements. Zippy Shell’s containers are ideal for moving and storage alike since they’re easily transportable. Zippy Shell’s containers are made of metal, which is sturdier, more durable, and stronger than wood. The open cages—which fit inside Zippy Shell’s portable trailers during transport—allow airflow to ward off any potential mold and mildew. If your belongings require storage, the company will shrink-wrap and store your shell in a climate-controlled warehouse, so don’t worry about your antique mahogany desk getting damaged. 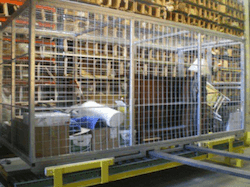 The cage has openings on every side, so you can easily tie down chairs, table legs, and other items too—this helps secure your furniture and prevent shifting during transport. When Zippy Shell delivers your cage to you, it comes inside a towable trailer. After dropping your container at your home, Zippy Shell will secure the trailer in place with a security hitch so no one can move it—nope, not even you. The trailer is roughly the length of two cars, so make sure your driveway, street, or parking lot can accommodate the space (and plan accordingly if your street requires you to move vehicles during certain hours of the day). Here’s an area where Zippy Shell has room for improvement. The company offers only 15-ft. containers, which is a major disadvantage if that size doesn’t work for your move. The 15-ft. shell size works well for two to three bedrooms, but if you have a load that’s significantly smaller or larger, you’ll either be paying for unused space or cramming your futon into an overflowing container. Although it’s not uncommon for moving container companies to offer a single container option, most companies start with a smaller size, allowing customers to rent multiple containers to match their loads. But since Zippy Shell offers only a 15-ft. shell, you run the risk of having too much space if you rent a second container. Heads up: Zippy Shell used to have 10-ft. containers, but though this size is still advertised on both its website and moving agreements, it no longer offers this option. Full container size 16 ft. x 7 ft. x 7 ft. Inner shell dimensions 15.7 ft. x 6.4 ft. x 6.4 ft.
Square footage 100 sq. ft.
Cubic feet 680 cubic ft.
16 ft. x 7 ft. x 7 ft.
15.7 ft. x 6.4 ft. x 6.4 ft.
One thing to note: Although the container itself measures at sixteen feet, the actual space inside the shell is slightly smaller. Zippy Shell partners with 1-800-PACK-RAT, so smaller containers may be available at specific locations. You’ll just have to take a gamble on which sizes are offered in your area. If you do use a 1-800-PACK-RAT container, though, you’ll pay two separate bills—one to Zippy Shell and another to 1-800-PACK-RAT. The Zippy Shell representatives we spoke with didn’t give us a clear-cut answer on whether or not 1-800-PACK-RAT sizes are available at every Zippy Shell location and vice versa, so be sure to ask the person you’re working with about the specifics of your move. Zippy Shell’s pricing is based, in part, on daily freights, which is essentially the rate it pays trucking companies to move your container. Containers are more expensive during peak moving season (summer) since the demand for freights is higher. To see these numbers in action, we got a quote for a 758-mile move from Salt Lake City, UT, to Portland, OR. According to the representative we spoke with, we were eligible for a free loading service promotion. Zippy Shell’s prices are high in comparison to other quotes we’ve received from competing companies (in one instance, by about $500). But the company’s overall efforts to save you money, including discounts and promotional services, put a dent in your overall price. And that’s more than the majority of its competitors offer. Half of your total bill will be due two days before Zippy Shell delivers your container. The company will bill the remaining 50% once your Zippy Shell has reached its destination. Simply put, getting a Zippy Shell quote is not as efficient as we’ve seen elsewhere. The company doesn’t offer instant online quotes—you have to pick up the phone and talk to a real, live human (yes, we know). Most top-dog moving container companies offer online quotes, so we consider this a ding against Zippy Shell. To get a quote, you’ll enter some basic information on Zippy Shell’s website, and a representative will call you to complete your estimate. Fair warning: If you plug your information into Zippy Shell’s quote generator, expect to receive a barrage of emails, plus a few phone calls. Although it wasn’t as ongoing as other companies we’ve worked with (cough cough, full-service movers), it was still overwhelming. The good news? Once you lock in a reservation, the price you’re quoted won’t change. So if you make a reservation in March but need to push your move back to June, Zippy Shell will still honor the original quote. Just make sure you call ten days in advance of your initial move date. When we were on the phone with our Zippy Shell representative, she also gave us a $90 discount for booking over the phone. Nowhere on Zippy Shell’s website do they list any sort of discounts. But hey, we’ll take it—advertised or not. Zippy Shell includes taxes in its quotes, so the price you see is what you’ll pay after the whole thing is over (as long as you don’t opt for any add-on services like loading or unloading after you receive your quote). Zippy Shell, like most moving companies, may hit you with hidden fees. Luckily, we did some digging, so you can know what to watch out for. After your free 30 days of storage on long-distance moves, each additional month you need to store your container at one of Zippy Shell’s warehouses will cost you $159. For the possibility that your full-length mirror shatters in transport or your dining room table loses a leg during unloading, Zippy Shell offers two protection plans: standard coverage and full-value replacement. None of this information was listed online—and the information on our moving agreement was outdated. We’ve already vetted the falsely advertised and missing information for you, but we still recommend you call Zippy Shell to work out the details of your move before you commit. Neither of Zippy Shell’s protection plans covers water damage, theft, earthquake damage, or riots. Zippy Shell’s trailers can go places other moving containers can’t. Your shell is delivered in a trailer that has a license plate, making it a registered vehicle. Because of this, the company can park your container on busy streets or in parking lots. Some cities don’t allow you to leave moving containers or dumpsters on streets, so Zippy Shell’s registered trailers offer you more freedom in where you can park the thing (which might also make loading easier). Other things we love? The trailers are weatherproof. They also have barn-style doors and come with loading ramps, which make loading easy as pie. You can carry or slide your unwieldy lamps and bulky furniture right into your container. We read that if two of Zippy Shell’s movers can load your things into a container in under three hours, the company will come and handle the hauling for you—free of charge. All you’d need to do is make sure everything is packed up and boxed beforehand. In reality, the specifics on this promotion were hard to nail down. For instance, one representative told us that free loading is available only at certain locations, but another said that the promotion is available everywhere. Similarly, the first representative we spoke with told us this offer is exclusive to long-distance moves, but the second person we talked to said it is available for local moves, too. Like we’ve said before, you’ll need to call Zippy Shell to get an answer. Ultimately, Zippy Shell offers this perk to ensure that it will get its trailers back from customers as quickly as possible. Either way, we’re not complaining about free moving help, and it’s a service most moving companies don’t offer. Zippy Shell includes thirty days of free storage on every long-distance move, which is not a bonus to be overlooked. Even some larger, nationwide competitors don’t offer this perk. If your bed frame, couch, or dining room table beats you to your final destination, Zippy Shell will store your container for an entire month. And if your new home isn’t move-in ready when you thought it would be, that extra month of storage can really save the day. This means you don’t have to scramble to figure out where to send your belongings or come up with the money to put them in storage. We didn’t get a cut-and-dried answer on whether this deal is offered on local moves, but the representative we spoke with said Zippy Shell will consider it case by case. Apparently, it all depends on availability at your local warehouse. If there’s space, the company will store your things; if there isn’t, free storage is probably out of the picture (unless you’re willing to pay for it). As far as reliable, no-frills moving container companies go, Zippy Shell has a lot to offer—but because it doesn’t accurately advertise its services, it’s difficult to know what’s available. Zippy Shell’s website and moving agreements are outdated, so don’t rely on them to answer your questions or provide current information. You’ll have to give the company a ring to discuss your options. Luckily, its representatives are knowledgeable and friendly. Moved with Zippy Shell before? We want to hear about it! Let us know in the comments section below. And if you want more moving container options, check out our best moving container companies. Zippy Shell is the absolute worst moving company you could ever pick!!!!!! I can’t say it enough. My daughter just had them move them across country and from the start they promised things that they never did. My daughters family was put on hold for several months, over charged, found broken and damaged furniture and the people at Zippy Shell were very rude to deal with. I would never ever use this company to move even a grain of sand 20 feet, they would find a way to ruin your life and charge you for doing it. Terrible company and I can’t say that enough !!!!!!!!!!!!!!!! Beware and steer clear of Zippy Shell, the only thing you’ll get from these guys is your life Zipped up and all full of grief.